I was captivated by Mario Vargas Llosa's disturbing novel, Death in the Andes. It is structurally a mystery story, but it can be best characterized as a compelling portrait of political violence in contemporary Peru. Mario Vargas Llosa is a captivating story teller and I found myself wanting to know more about the people that inhabit the harsh mountains of Peru. "Peru's Indian Peoples and the Challenge of Spanish Conquest - Huamanga to 1640" by Steve J. Stern exactly met my needs. 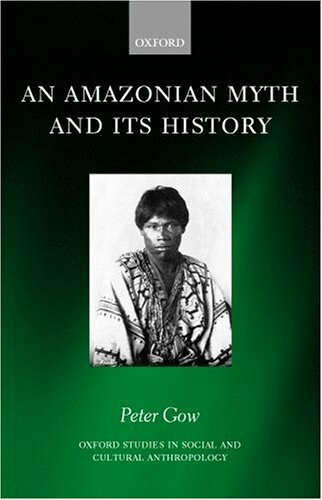 This scholarly text tells the story of how conquest transformed a resilient and vigorous people into an inferior caste of Andean Indians. 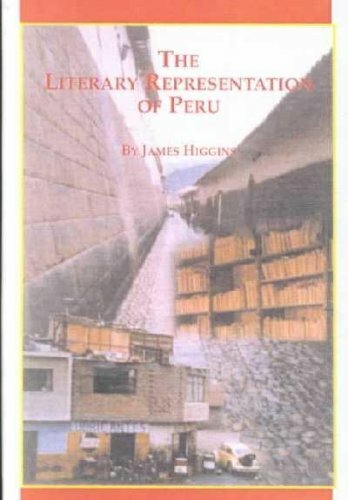 The geographical focus is a mountainous region in southwest Peru dominated by the city Huamanga (today known as Ayacucho, a city not too distant from the fictional town of Naccos, the setting for Death in the Andes). 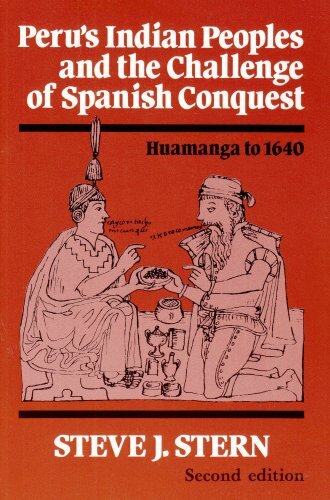 The lengthy title, "Peru's Indian Peoples and the Challenge of Spanish Conquest - Huamanga to 1640", may be a little intimidating, but the book is well-written and is largely accessible without undue effort. The first chapter paints an intriguing view of a pre-Columbian society based on complex reciprocity relationships between members of extended families or kinships called ayllus. These arrangements allowed dispersed groups to exploit isolated, island-like, ecological niches like cold high mountain pastures or low dry valleys while depending upon others for products grown or created elsewhere. The ethnic groups native to Huamanga welcomed the overthrow of the Incas and allied themselves quickly with the victorious Spaniards. "Local communities sacked warehouses once dedicated to the discredited Incas." Chapter 2 examines the rise and subsequent demise of these post-Incaic alliances with the Spanish. 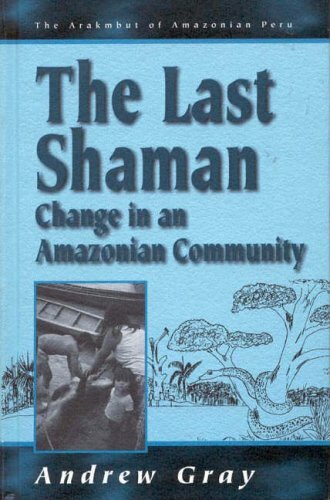 Chapter 3, "A Historical Watershed", describes the revival of Andean religious fervor (the Taki Onqoy) and an unsuccessful effort to expel the Spanish colonizers. Remarkably, the Spanish, under the formidableleadership of Don Francisco de Toledo, within a decade had dramatically revised their colonial structure, and largely eliminated any possibility of future revolt by the Andean Indians. 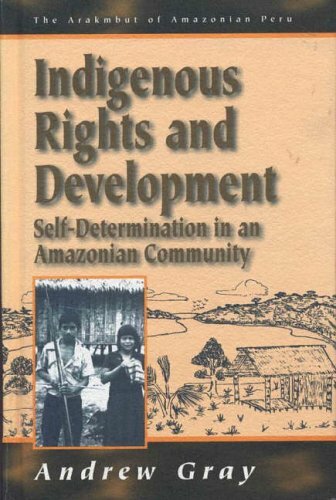 Chapter 4 details the political economy of colonialism in the Huamanga region while chapter 5 investigates the contentious legal battles between the Indians and the colonizing elite under the Spanish judicial system. Both chapters are intriguing, but are more difficult for the non-specialist. I was surprised by how carefully the Spanish structured the taxation system; it siphoned away the maximum wealth without completely devastating the Andean economy. The Indians resisted this economic oppression through evasion as well as by tenaciously exploiting the Spanish legal system to protect their rights. 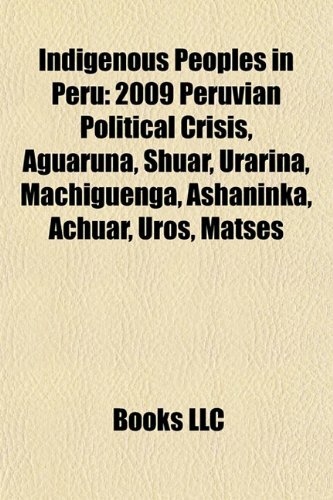 Set against conventional views of Peru as a place where indigenous mobilization has been absent, this book examines the complex, contentious politics between intercultural activists, local Andean indigenous community members, state officials, non-governmental organizations, and transnationally-educated indigenous intellectuals.It examines the paradoxes and possibilities of Quechua community protests against intercultural bilingual education, official multicultural policies implemented by state and non-state actors, and the training of authentic” indigenous leaders far from their home communities. Focusing on important local sites of transnational connections, especially in the highland communities of Cuzco, and on an international academic institute for the study of intercultural bilingual education, this book shows how contemporary indigenous politics are inextricably and simultaneously local and global.In exploring some of the seeming contradictions of Peruvian indigenous politics, Making Indigenous Citizens suggests that indigenous movements and citizenship are articulated in extraordinary but under-explored ways in Latin America and beyond. I would second what the other reviewer said. The book is refreshingly free of jargon and written with an open, humble tone. The author clearly is a good listener who does not jump to quick conclusions or make snap judgments about people. 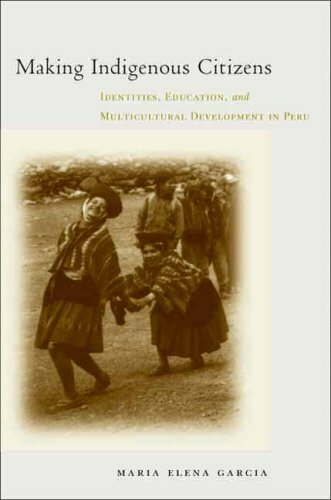 Her discussion of the controversies over bilingual education programs in Peru--and the differing views of state officials, ngos, activists, and community members--is fascinating, as is the discussion in the last full chapter of changing notions of what it means to be indigenous. Again, no post-modern jargon here--just an eye for complexity. She also offer some challenging thoughts on the notion of Peru having an absence of indigenous activism compared to Ecuador or Bolivia. Again, she does that with a lack of pretension or scholarly self-righteousness that is welcom. I just used it with my undergrads in a polisci class with great success. If this topic interests you, this is an important book to read. 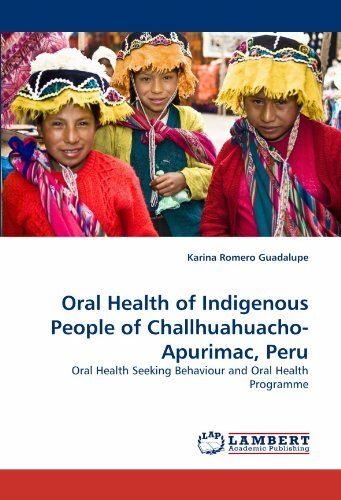 Do not miss this incredibly important addition to Andean and indigenous studies!!! In the early twentieth century, Peruvian intellectuals, unlike their European counterparts, rejected biological categories of race as a basis for discrimination. But this did not eliminate social hierarchies; instead, it redefined racial categories as cultural differences, such as differences in education or manners. In Indigenous Mestizos Marisol de la Cadena traces the history of the notion of race from this turn-of-the-century definition to a hegemony of racism in Peru. 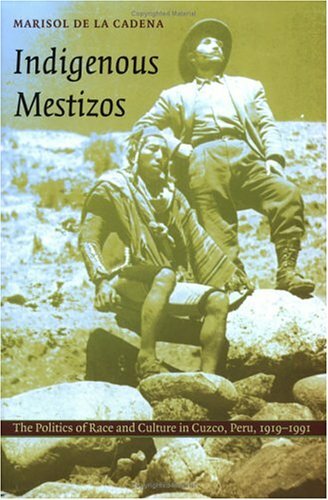 De la Cadena’s ethnographically and historically rich study examines how indigenous citizens of the city of Cuzco have been conceived by others as well as how they have viewed themselves and places these conceptions within the struggle for political identity and representation. Demonstrating that the terms Indian and mestizo are complex, ambivalent, and influenced by social, legal, and political changes, she provides close readings of everyday concepts such as marketplace identity, religious ritual, grassroots dance, and popular culture, as well as of such common terms as respect, decency, and education. She shows how Indian has come to mean an indigenous person without economic and educational means—one who is illiterate, impoverished, and rural. Mestizo, on the other hand, has come to refer to an urban, usually literate, and economically successful person claiming indigenous heritage and participating in indigenous cultural practices. De la Cadena argues that this version of de-Indianization—which, rather than assimilation, is a complex political negotiation for a dignified identity—does not cancel the economic and political equalities of racism in Peru, although it has made room for some people to reclaim a decolonized Andean cultural heritage. This highly original synthesis of diverse theoretical arguments brought to bear on a series of case studies will be of interest to scholars of cultural anthropology, postcolonialism, race and ethnicity, gender studies, and history, in addition to Latin Americanists. 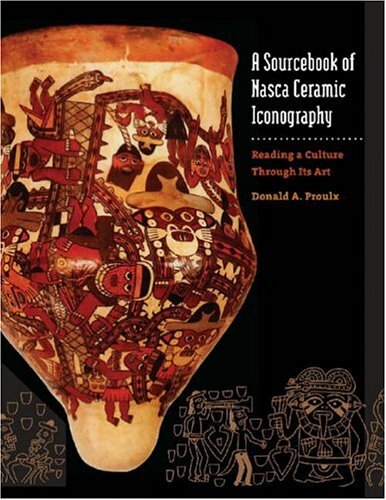 Donald A. Proulx's book begins with a brief overview of the people who produced Nasca pottery. It then describes the rules or canons used by Nasca potters to form and decorate their pottery. It summarizes the discovery of the first Nasca pottery. 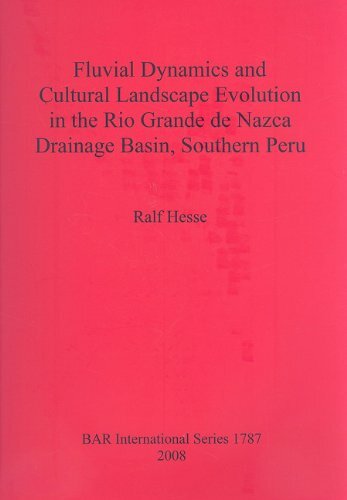 It describes how 800 years of Nasca art are divided into various periods and the basis for the chronology. It also describes the methodology of both Proulx and other experts in organizing Nasca art. Then, as Proulx writes on his website: "The centerpiece of the book is a detailed classification and description of the iconography along with an interpretation of their meaning in the context of the Nasca Culture. [Then] I use the iconography (along with archaeological evidence) to reconstruct the religion, political organization and everyday life of the people of this ancient civilization." For the general reader like myself, the images in the "centerpiece" are incredible, and stay in the mind well after the pages are closed. 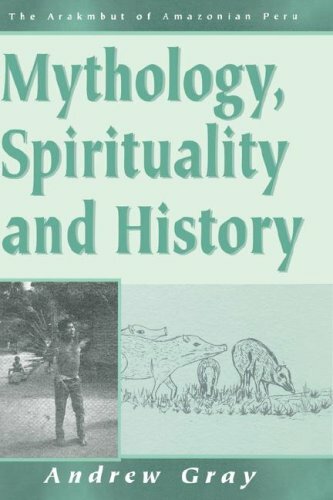 Images of realistic plants, animals, birds, and fish and numerous abstract anthropomorphic creatures persist in memory, even though even to experts, some of the forms and meanings are incomprehensible today. I was particularly struck by the comparison between the images on the pottery and the shapes of the Nasca Lines, which Proulx has also studied. I poured over the reconstructions with a sense of real excitement. I was fascinated with how Proulx created this incredible collection of images. 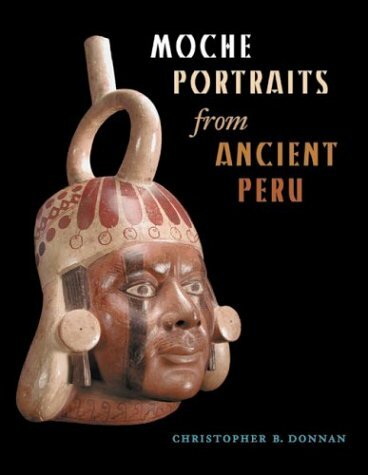 45 years ago as a student he was hired to catalog a collection of Peruvian artifacts. He continued his interest by photographing Nasca collections throughout Peru and the United States as well as key museum collections in Germany and Great Britain. He added all of the images he found in books as well as museum collections available on the Internet. He then digitized the entire archive and now has approximately 24,000 images in an electronic archive representing pieces from over 150 museums and private collections. There is no doubt that this book, and the conclusions Proulx reaches, are based on the largest collection of Nasca images ever assembled. As a consumer, I asked myself, so why, oh why doesn't this book include an CD containing all of these images? It would be so much fun to search and compare images from several different pages, and perhaps even find a connection that Proulx had missed. His answer, also perfectly comprehensible appears on his excellent website [Google "Donald A. Proulx"]: "It has always been my desire to share my archive with other scholars until I realized the legal prohibitions of distributing the disks. I would have to obtain permission from over 200 sources to be able to do this. I also discovered that the file names that I generated on my Macintosh computer are not all compatible with PCs, and many of these names would have to be modified to be used on these other operating systems." I am very disappointed that I can't play with these images on my own computer. Nevertheless, the book is a treasure. As a lover of art and a student of how art is integrated into culture, I was enchanted. I'll return to these images over and over again. Offers an unprecedented exploration of incendiary conditions that stoked The Great Rebellion of 1780-1782 in Upper Peru (present-day Bolivia). The Great Rebellion claimed tens of thousands of lives and traumatized imperial psyches for decades. It was one of the most devastating political and human disasters in Latin American colonial history. 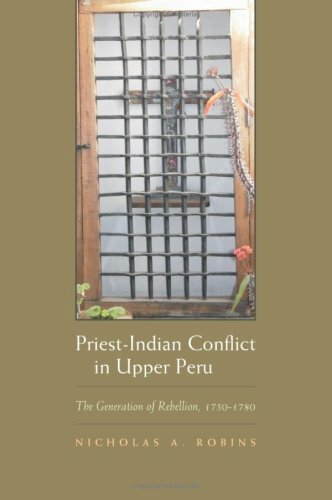 Using extensive primary research, Nicholas A. Robins delves into the fractious relations between Indian communities and their clergy and the role that such tensions played as a major causal factor in the rebellion. This is a very poorly written piece of history.I'm not an expert on the topic but I know that most English teaches would have returned this.He should have improved the writing and the editors should have intervened. This digital document is an article from NotiSur - South American Political and Economic Affairs, published by Thomson Gale on June 22, 2007. The length of the article is 1611 words. The page length shown above is based on a typical 300-word page. The article is delivered in HTML format and is available in your Amazon.com Digital Locker immediately after purchase. You can view it with any web browser. Title: PERU: ACHUAR INDIGENOUS COMMUNITY SUES OCCIDENTAL PETROLEUM FOR DECADES OF CONTAMINATION.